At the corner of the cluster of buildings around Nevill Holt Hall, the long ironstone block, crenellated and pedimented, is quite grand for a stable. For a theatre, on the other hand, it is compact and intimate. The challenge of this project for us, was that few of the conventional configurations of a theatre were possible, but this was also precisely its charm. No fly-tower, no foyer with a grand stair. The plan dimensions were promising, at 16 x 24 metres, and the temporary theatre demonstrated that performers and audience could be shoehorned in. Every addition or adjustment had to be judged on its merits, to work in relation to the ironstone walls, and the doors and windows that pepper them, bending to these constraints gave direction to the many fine judgements that make up a theatre. Therefore, although in no sense experimental, many aspects of the design are quietly unorthodox. We were determined to keep the stone courtyard walls visible, to make them a strong container of the theatrical space – although we had to work from photos for the first year, and it wasn’t until planning consent was granted and the temporary theatre was removed that we saw these walls for the first time. Like with all vernacular constructions, you can feel the weight that the walls carry. In excavating down and building up, it was essential not to undermine or weaken them, not just structurally, but also in terms of how you perceive them. Therefore, we excavated for the stalls and the orchestra pit at a distance of 2 metres, leaving a continuous perimeter of solid ground at the base of the walls, avoiding underpinning. We built the new roof, a rectangular structure that doubles the volume, directly off the stone walls, using their structural spare capacity to carry the new steel and wood structure. This was achieved by threading new concrete padstones between the existing rafters, to spread the load across the wall. The slight stepping of the wood lining integrates ventilation ductwork and gives the roof volume a gently dynamic taper, distinguishing it from the walls. We pushed the balcony as high as we could, so that it sits above the doorways. This height makes the rear stalls area feel unusually generous, and even the rearmost seats have a good connection to the stage. We also pulled the balcony away from the walls, so it seems to float within the room. The walls and roof continue around it, so it doesn’t truncate or subdivide this beautiful, simple space. The columns are solid steel, made to look more slender still by their cross shape. The balcony is an operatic horseshoe, focusing the audience towards the performance. At the corners and doorways, the rear of the balcony volume is scalloped and sculpted to echo and answer the stone details that they abut. 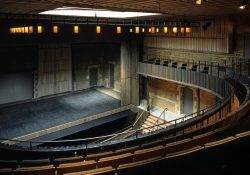 The proscenium, often the most solid of divisions, is here made up of light wood panels that can even be hinged in to the stage, to emphasise the room shared by performers and audience, rather than the divide between them, for example for a concert or a recital. We selected and detailed the materials for their acoustic warmth, as well as their visual fit with the ironstone walls. The Douglas Fir boards on the courtyard ceiling and balcony walls have been sandblasted and bleached, giving them a soft, driftwood-like character. The Chestnut on the floors and balcony fronts has been stained darker to contrast with the simple volume of the courtyard room. The concrete walkway at the foot of the walls is cast with wooden boards, so remains rough and stable-like. This restrained but rich material palette is brought to life by the daylight from the large central rooflight – as it rakes across the rough stone walls, the light is a reminder that this is still a courtyard, even if it is no longer a stable yard. For performances, a blackout blind darkens the room as the stage lights power on, and the walls and doorways recede into the background. The in-between quality of this stable-theatre, neither fully interior nor exterior, is entirely fitting for the imaginative space of opera.